Recent heavy rains will help boost area lake levels, but not nearly enough to make up for the summerlong drought, experts say. At Lake Ray Hubbard, for example, where the lake level has dropped six feet in the past few months, you don't have to look far to see the signs. In some spots, debris that is usually several feet underwater now pokes up from the bare bottom. "We definitely need some rain or it's going to be tough going into next year," said boater Jerry Johnson. The low lake levels make simple boating dangerous, he said. "It's rough," Johnson said. "Almost every week, we have a boat that's getting run up on a sandbar and can't get off. It's been tough." The rain that parked over North Texas much of Thursday and Friday dumped as much as five inches of water in some places. 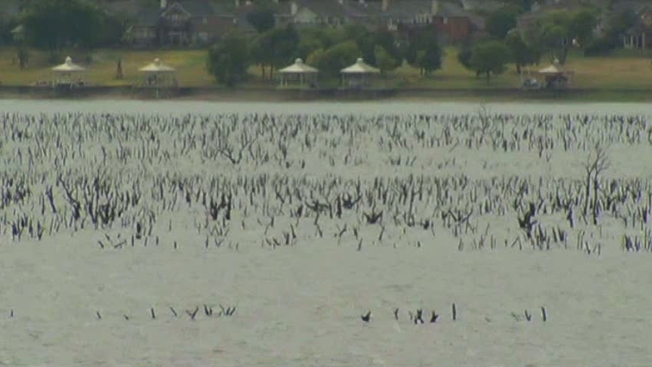 But at Lake Ray Hubbard, the rain amount was far less. "Looking for more rain, we all are," said boat owner Jim Helms. "We're hoping for more. We're hoping for more. We'd buy some if we could."